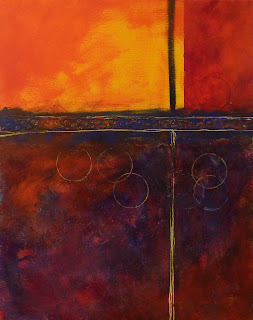 The freedom of working with acrylic in an abstract way has been occupying my painting time lately. I like the way my instinct can take over and attention to detail, shape, and form doesn't bog me down. Instead, my ideas are organic and evolve as the canvas is covered. This 16x20 inch painting emerged yesterday and was a delightful way to spend an afternoon. Although the painting is not for sale, I have uploaded photos of it so it can be purchased in print form at this link. Click here to view it in my print gallery or make a purchase. After painting landscapes for a while, I had a yearning to change things up. 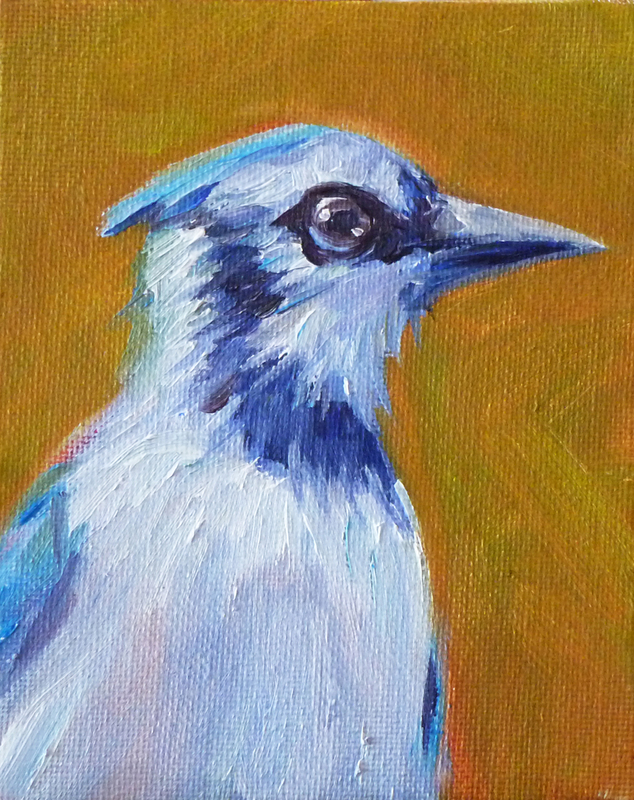 This little blue jay is the result. He is painted in oils on a 4x6 inch canvas panel. I love painting the texture of feathers and this little fellow was no exception. He is looking for a new home, so if you are inclined to adopt him, click on this link where you can view him in my Etsy shop or make a purchase. He is very sweet and doesn't even need a cage. 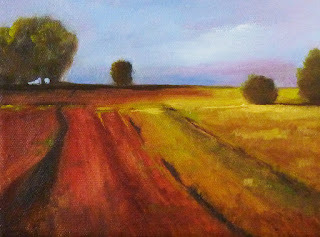 Today's painting is unusual for me in that it is not painted in oils, my usual media. 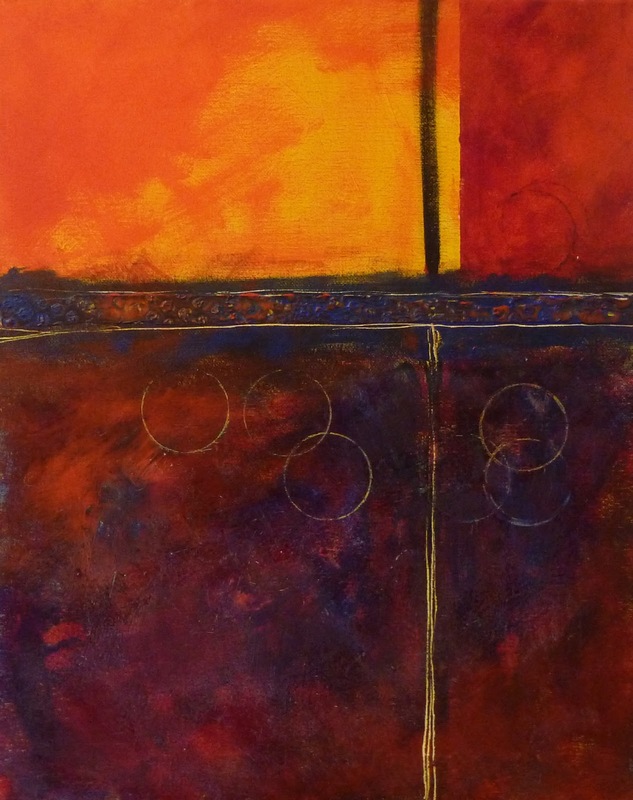 This painting was done using acrylic paints. They have never been my favorite because of the quick drying time. It always seemed that the paint was dry before I could take it from the palette to the canvas, but recently I tried a Masterson Sta-Wet Palette. It was ideal! There is a sponge the size of the palette that is topped with some kind of special disposable palette paper that is dipped in water before using it. With the damp sponge and paper, the paint stayed wet and manageable like never before. It was wonderful to paint an entire 16x20 inch painting in a few hours. I didn't have to wait for an under painting to dry and if something didn't please me, I could paint over it in just a few minutes. Love it! I may start painting with acrylics a little more frequently now that I have my wonderful new palette. Click on the Fine Art America link to purchase prints of this painting or visit here. Outside the temperature is hovering in the thirties. I can't complain too much, at least it isn't raining, but it is the delight of spring that is capturing my dreams. 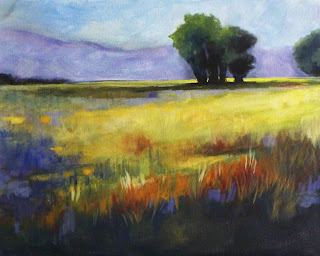 This 6x8 inch painting was inspired by the thought of days of spring and fresh country air. Can't wait for a little sunshine. The painting is available for sale in my Etsy Shop. You can view it or make a purchase here. It has been a while since I painted flowers. The season might have something to do with it. Finding fresh flowers in December and January can only be done by a trip to the florist or the hot house. Since I didn't make either trip, this little vase of red flowers came right out of my head. I much prefer the real thing, but it did help brighten my winter mood and give me hope for some upcoming warmer weather. 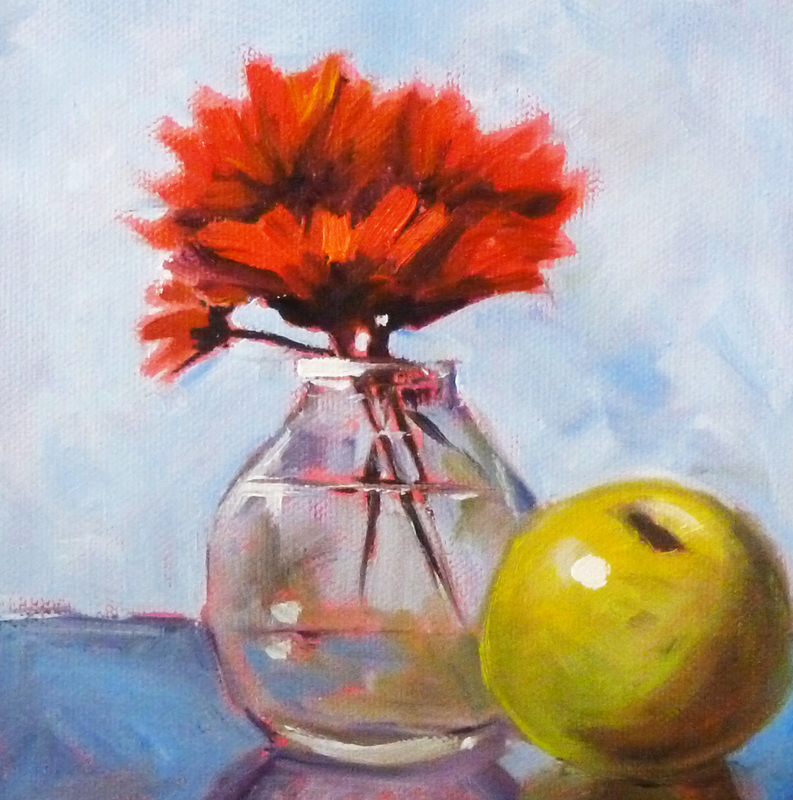 The painting is 6x6 inches on a gallery-wrapped canvas and can be viewed or purchased here. Put on a pair of snow shoes and head up to the mountains. The scenery is beautiful and the snow pack is great. 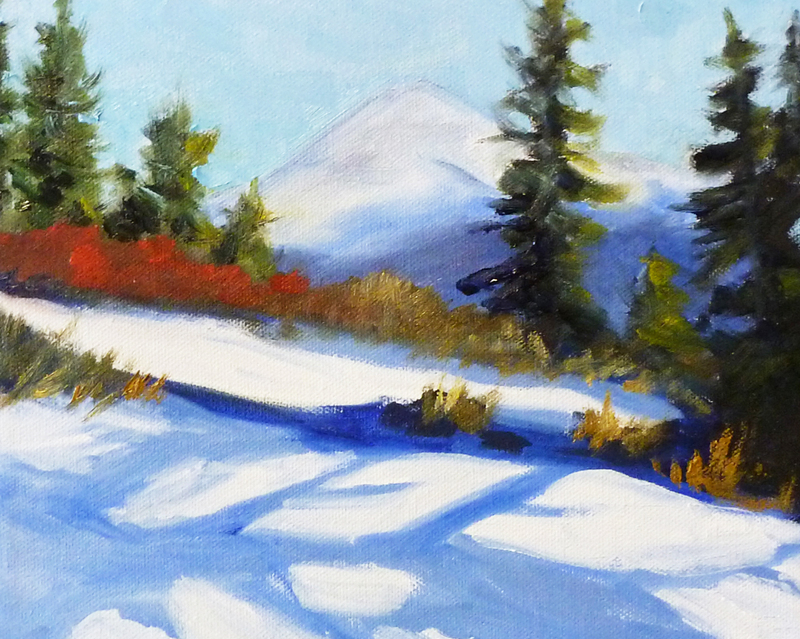 This 8x10 inch oil painting of a delightful mountain destination can be purchased at my Etsy Shop. Click here to view or make a purchase.